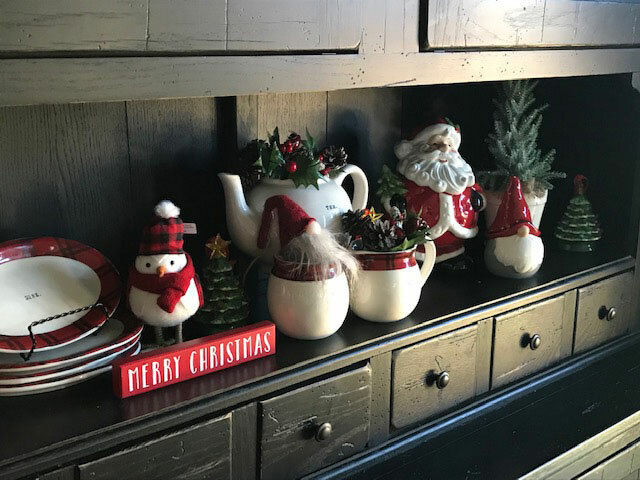 I am so excited to be joining a group of bloggers I met through Facebook to share a peek inside our homes decorated for the holidays! 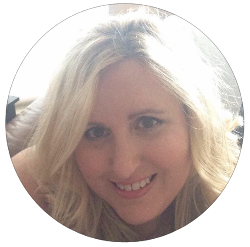 If you are popping over from one of their blogs, hello and welcome! So happy to have you visit! 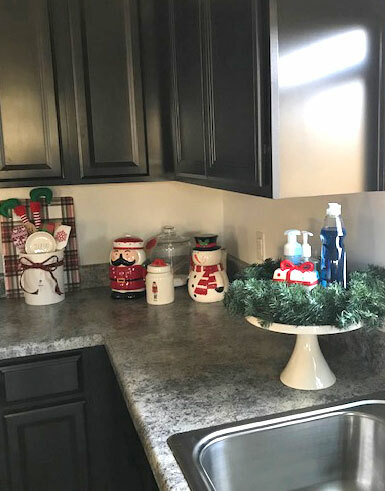 Isn’t it fun looking at everyone else’s Christmas decor? 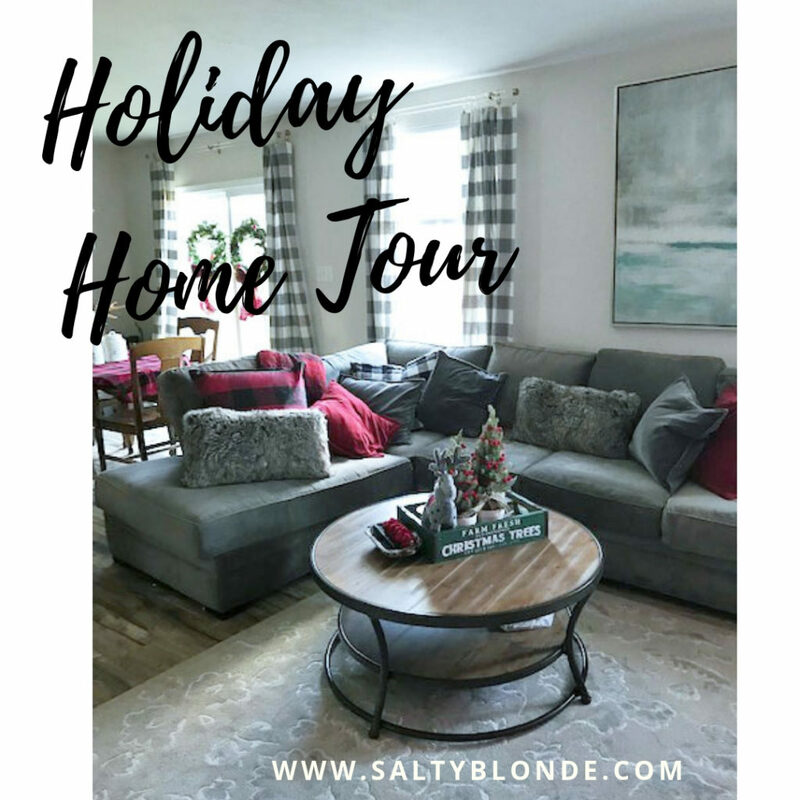 I could spend hours checking out holiday home tours. It gives me so much inspiration. I am going to warn you that this post is very photo heavy. 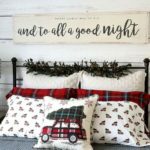 There’s really no way to avoid it when talking about your holiday home decor! 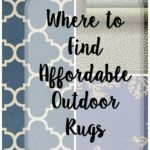 If there’s anything you have questions about, let me know in the comments. 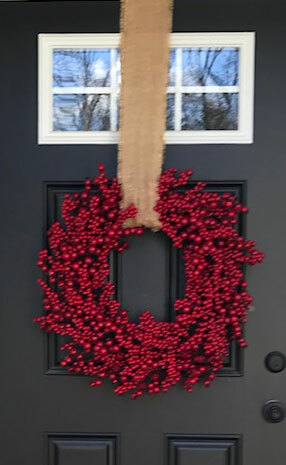 From the minute we picked out a black front door, I knew I wanted a red berry wreath on it for Christmas. I had a hard time finding the perfect one, but when I did, it ended up exactly like how I pictured it in my head! I love when that happens. We changed up the rest of our outdoor decorations this year and built some tomato cage lighted trees. Unfortunately, we have had the worst wind ever the past few days, so they got a bit beat up and aren’t photo ready today! Even after being tossed and turned a couple times, they still are awesome at night! If you haven’t ever tried making them, I highly recommend, super easy and give off a big light payoff. 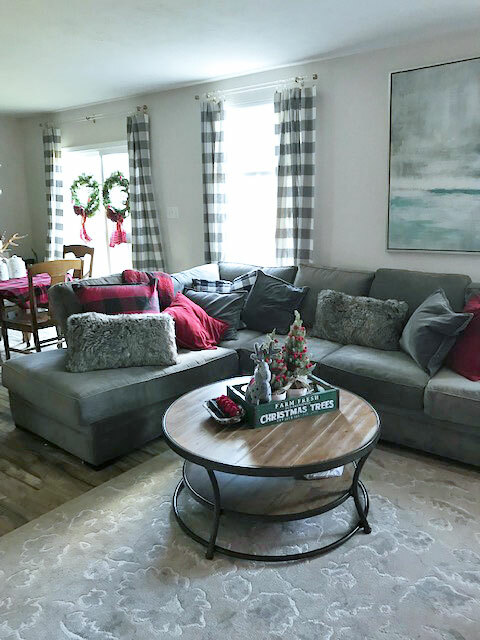 My house is decorated mainly in various tones of gray and last year I mainly stayed in the gray and silver lane for Christmas decor. This year, once I had everything out, I decided I wanted to add some pops of red to that mix. 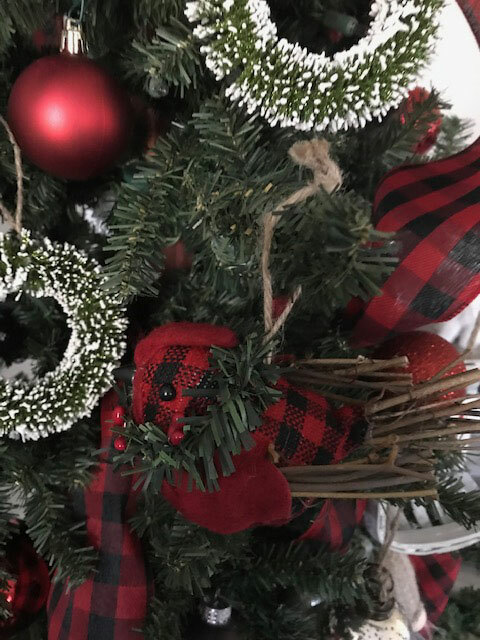 If you visited the blog before, you know I am a sucker for anything buffalo plaid, so of course, I had to use some in my holiday decor. I started with the red and black checked pillows and just went crazy from there. I added the red velvet covers to my gray and fur stash. If it is possible to have a sub Christmas theme, my sub theme is a Christmas tree farm. Maybe I should call it a co-theme? 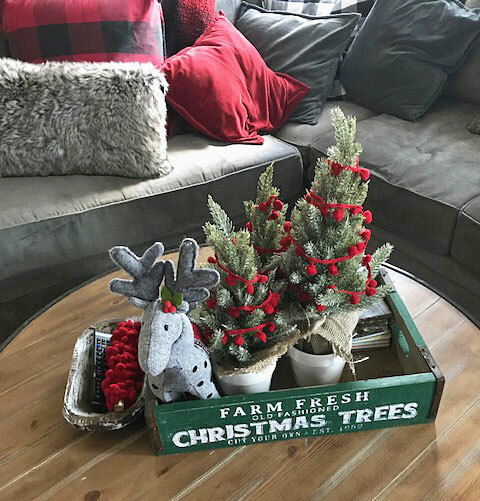 I fell in love with this evergreen colored tray and knew I wanted to put a grouping of trees in it. It was a little bit too plain on its own, so I added some pom pom trim to fancy it up. 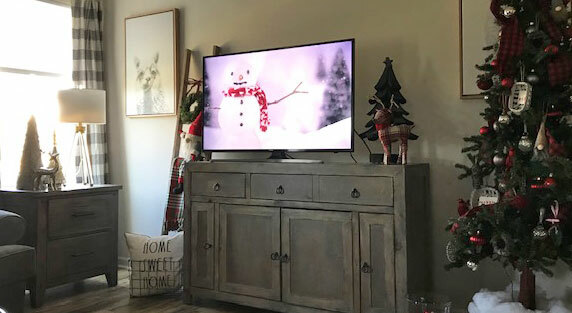 Televisions are so hard to decorate around, especially for the holidays. I put a little black wood tree and a plaid deer up and called it a day. 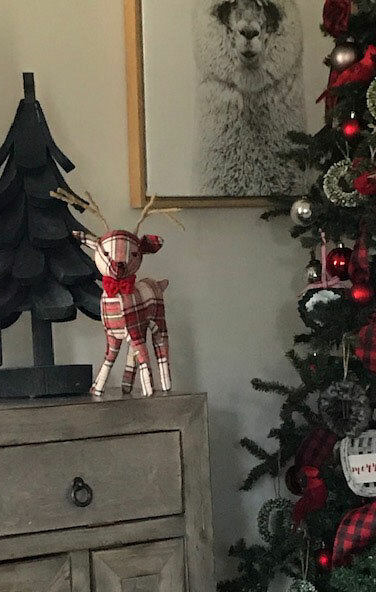 Isn’t this plaid deer the cutest? I couldn’t resist him and am so glad I found the perfect place for him! I know, I know, I need to take down my llama print, but I love him so much! Plus it cracks me up seeing him peek around the tree from various views of the house. He’ll come down before actual Christmas. The other side of the tv has my blanket ladder. 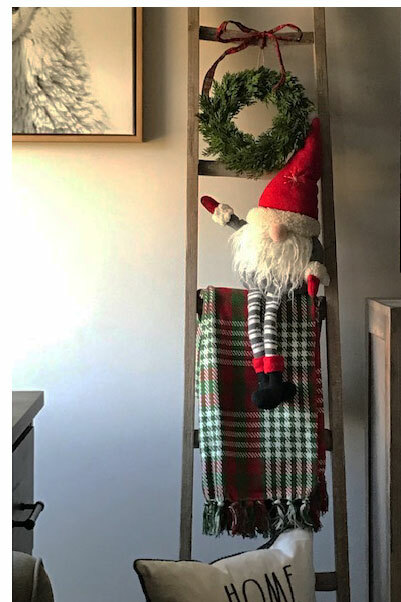 I added a Santa gnome and am seriously worried about his safety due to my dog’s dislike for Christmas decor that looks like a dog toy! We’ve had several incidents where he has tried to dismember some decor because he mistook it for a dog toy or an intruder, who knows!! I was planning on buying a new tree this year, since our old one doesn’t quite fit this new space. It’s a bit too small, but I ended up waiting on buying a new one. There’s technically nothing wrong with this one, so it’s hard for me to justify buying one. I will probably look for one during the after Christmas sales. 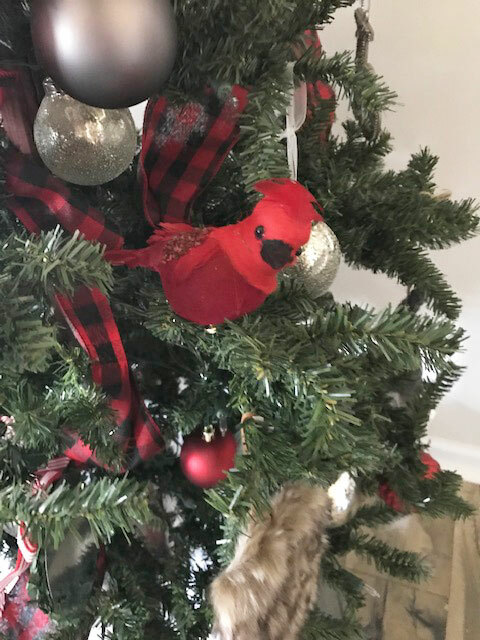 I found myself pinning several photos with cardinals in them, so when I saw some cardinal clips at Hobby Lobby, I had a vision of what I wanted to add to my already existing Christmas tree decor. 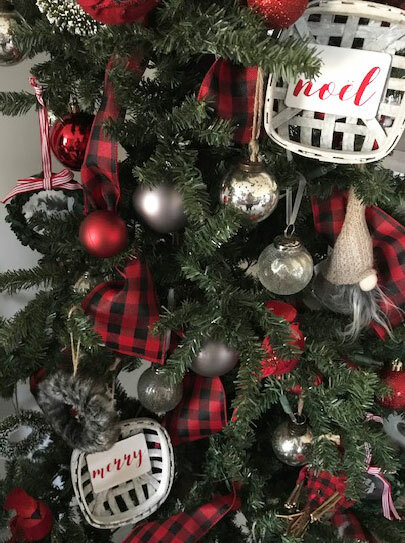 I started with the gray themed stuff I had from last year, added some buffalo check ribbon, the cardinals, some gnomes, some fur and a ton of red bulbs. I have to say I love it! I go back and forth each year between wanting a minimally decorated tree and a tree that you can barely see the branches. This year was a let’s do it up year, clearly! 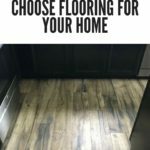 My home is an open concept floor plan, so my living room opens up to the dining room and kitchen. I kept my buffalo check theme going in here, but added in a touch of green. I apologize for the wrinkles in my tablecloth! Sunday was the first sunny day we have had in forever, so I had to hurry up and take advantage of the sun to get my photos done and missed steaming my tablecloth! Don’t tell my mom! I had grand plans of putting greenery in my chandelier, but because of the crystals, it’s not as easy as you would think. I settled for adding some Rae Dunn ornaments and a couple other “special” ones via plaid ribbon. 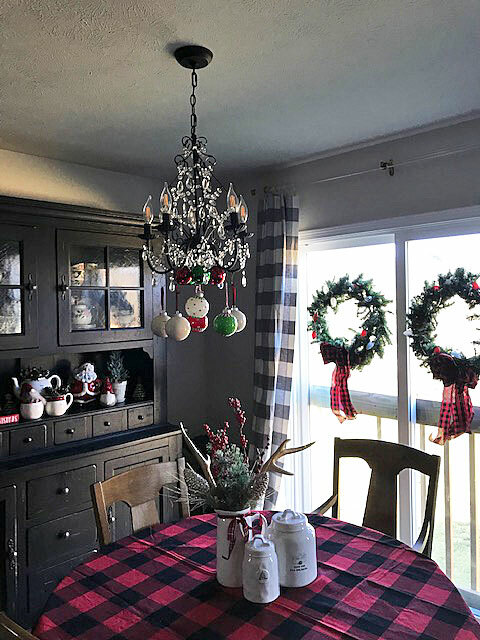 When I have Christmas dinner, I will be adding in my table leaves and switching up tablecloths and centerpieces, but for now, a little bit of Rae Dunn is working. I pulled out some Christmas plaid dishes for my hutch display too. The trees are minature ceramic lightup trees that run on batteries. I absolutely love them all lit up at night! My two tier tray sits on my island and is a constant work in progress. I am always switching things in and out on it and sometimes scrapping all of it and totally redoing it. Right now it has some of my Christmas salt and pepper collection and some bottle brush trees. 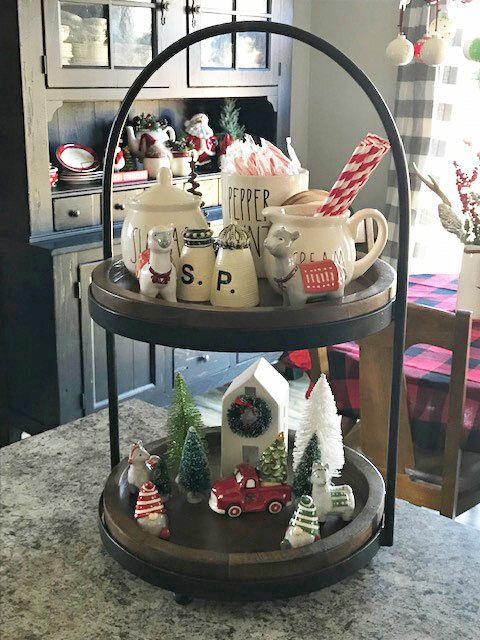 I love decorating tiered trays for the holidays and Pinterest has endless inspiration! 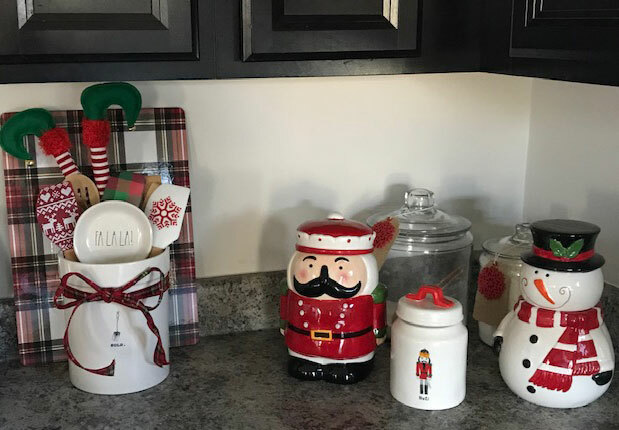 I swapped out most of my every day canisters for some Christmas themed cookie jars. 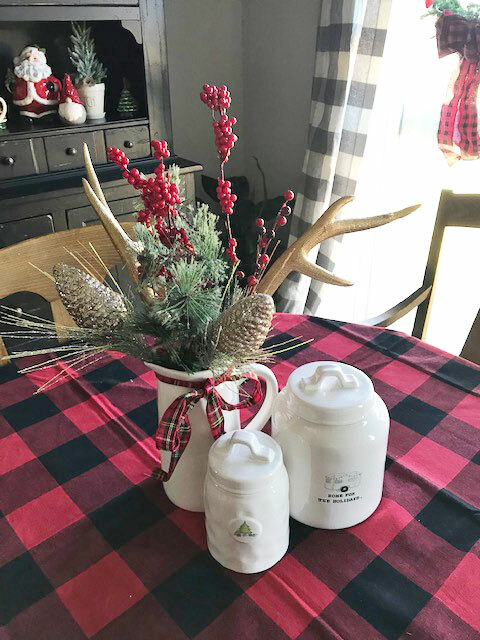 I am using them as canisters during the holiday season and I love how festive my kitchen is with them. 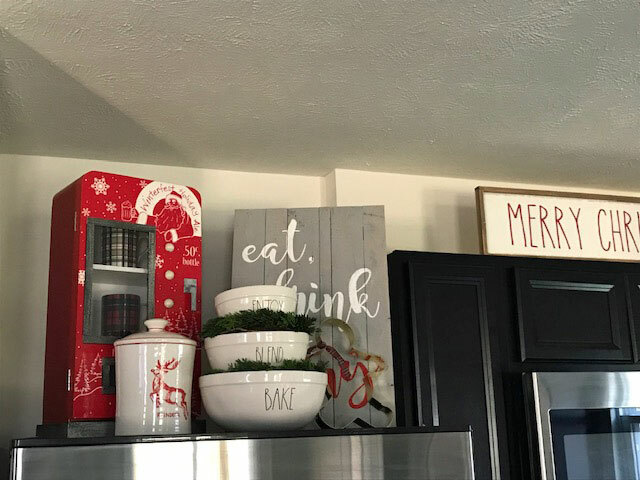 I made the Eat, Drink and Be Merry sign last year with my sister at a sign making party. I propped it up on the top of my fridge with a couple eat and drink themed items. I think my fave is the giant gingerbread man cookie cutter! I told you I went a little crazy this year with the Christmas decor! If we get another sunny day, I will try and do some photos of my Christmas bedroom and bathroom. If you’ve made it this far, thanks so much for stopping by and I hope you and your loved ones have an amazing holiday season! 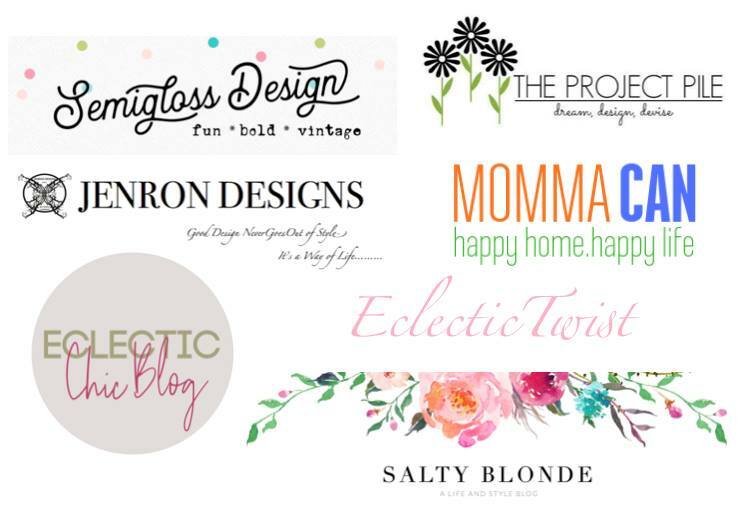 Before you go, stop by and check out some of my blogging buddies and their beautiful decor via the links below! No llama drama right? Thanks for stopping by! Your home is so lovely, so perfectly cozy! I love buffalo check too! Glad you could join us! Thank you so much! Clearly it is genetic! Bethany this is so cozy and inviting! That little santa dude on the ladder made me so happy and your pops of red are just beautiful. What a lovely job! So thrilled to pieces with the grays and reds mix of your theme! One thing that really caught my eye was the creative way to stack the mixing bowls! 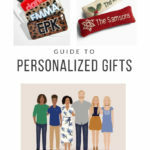 Happy to have you join our holiday crew! Bethany enjoyed all of the homes. They are all lovely. 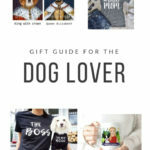 Thanks for checking out my blog friends! Thank you so much for the sweet comments! I completely revamped my style and the hutch was pretty much the only thing that survived! Appreciate the compliments!